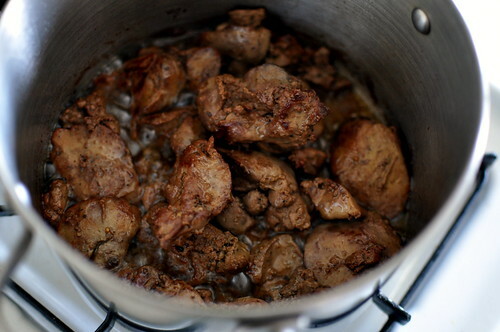 Growing up, I always called dibs on the gizzards whenever my mom roasted or fried up chicken for dinner. Unlike the chalky livers and slippery hearts, the gizzards were deliciously chewy and mostly neutral in taste. A quick sear with a sprinkling of salt and pepper made for a side dish that oftentimes surpassed the main course. 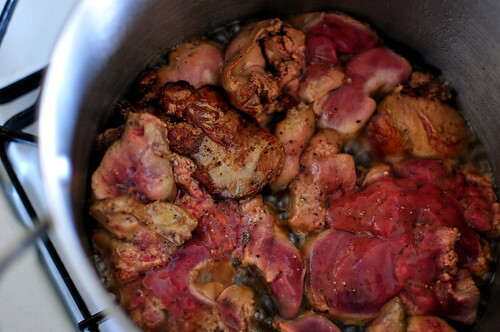 Although I favored gizzards above all in the giblet sack, sometimes a hunk of liver would mistakenly pass my lips—once offals have been chopped up and sauteed, they start to look a lot a like! While I endured liver on those occasions, I never found it remotely pleasant. Things started to look up for liver and me on a visit to Pizzeria Mozza last fall. 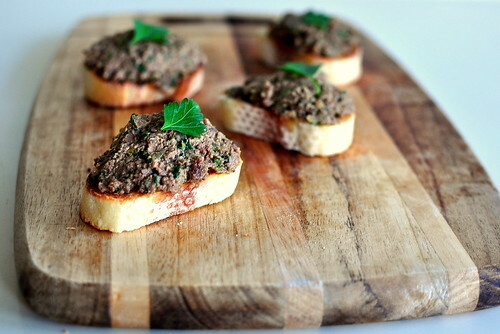 I went on a whim that evening and ordered the much-buzzed-about chicken liver bruschette. I wasn’t sure what to expect, but one bite and I was completely taken. The pate tasted like the liver I loathed as a kid, but the bright and savory notes alongside it provided depth and interest. This pate had soul. 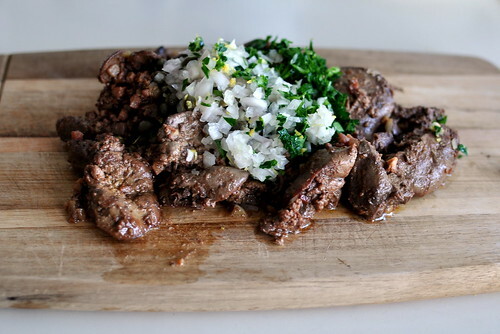 My beloved gizzards had better watch out because chicken livers are definitely gaining ground. In a large saute pan heated over high heat until it is almost smoking, add one-fourth cup olive oil. 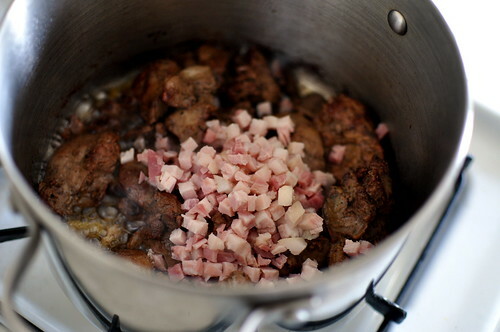 One by one, add the chicken livers. Adding one at a time prevents the pan from cooling too much, and it ensures you will have room for all of the livers because they shrink immediately when they hit the pan, allowing more to fit. Cook the livers until they’re a deep brown, about 2 minutes on each side. Dump the contents of the pan onto a large cutting board, making sure to get all the flavorful bits from the bottom of the pan. Pile the parsley, shallots, capers and lemon zest on top of the chicken livers and drizzle over it the lemon juice and one-fourth cup oil. Chop everything together coarsely with a large knife. Drizzle over another one-fourth cup olive oil and continue to chop, regathering the ingredients into a mound from time to time. Continue to chop until the livers are the consistency of coarse paste, almost pureed but with more texture. 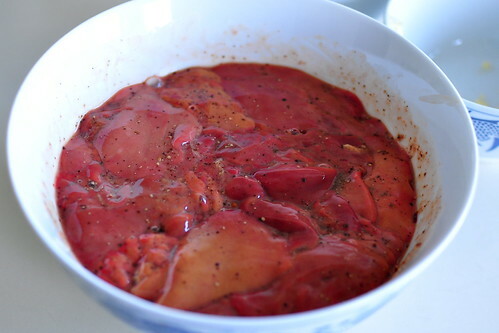 Add additional olive oil as needed; the livers should be moist and glistening but not so loose the pate won’t stand up. Serve immediately, or cover and refrigerate before using. 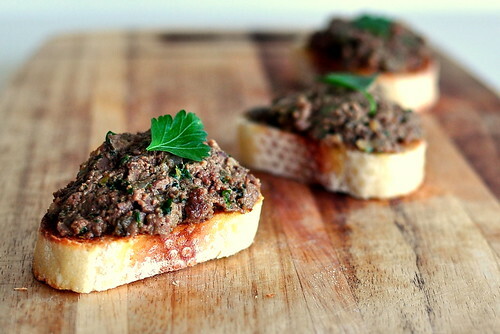 At Mozza, the pate is served as bruschetta over crostini (toasted bread brushed with a little olive oil and rubbed with garlic cloves) and topped with guanciale; they also recommend serving it topped with pancetta or a sprig of parsley. The pate can be made up to a couple of days in advance; bring to room temperature before serving. That was such a lovely night. Perfect way to spend Halloween. 🙂 Want to do it again next year? Oooooh, I wanna make this! LOVE Mozza’s Chicken Liver Pâté! Thanks for posting-looks great! seconds on the next halloween date! 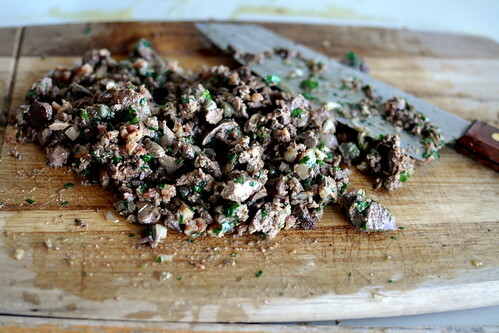 that pate looks awesome….needs small strips of bacon though, ha! massaging the livers..how fun! this looks fantastic! kim just yelled at me for forgetting to get chicken gizzards–she loves it in her pho ga.
Mmmm! Sounds delicious, and beautiful presentation, too. Just about the perfect season for it — nothing better than a spring picnic with a little tin of homemade paté along for the ride! i love offal and this looks superb. i also use to call dibs on the innards as a child and it was usually the heart. bam! That looks wonderful! – And I was the weird kid who wanted the gizzards, liver, heart and as a family we fought over the neck…yep. I’ve never made liver pate and this looks like a perfect recipe to start with, thank you for sharing! I wonder if you could use red wine instead of brandy/cognac? The combination of ingredients sounds delicious, and your photo essay rocks! You know its strange but growing I never really liked liver except..except when its in the form of “Pate” then I love it,especially spread over sandwich ooo yum! Let me know if you end up trying it. It’s on their new Seasonal Menu. Ann @ Healthy Tasty Chow – I think that red wine would be a fine substitution to deglaze the pan and to impart a little something to the pate. I made this! but I added tequila instead of brandy because its what I had around 🙂 and artichoke pesto in place of the oil in the chopping stage at the end, again, had it around. I can tell you it was truly outrageously good.